All of our vacation packages include private air charter transportation between Anchorage and the lodge as well as your ADF&G fishing license, salmon stamps, bed taxes, private land use fees, and National Park Service fees. The deluxe riverside cabins all have views of the Kvichak River and each have a private bathroom. Two people per cabin. Prices are per person. The Iliamna Cabin suite is a perfect setting for a group of 4 friends, family, or business associates to stay while visiting our lodge. The cabin has two separate bedrooms as well as a loft for sleeping and also has a living room and wet bar area. The deck offers an unobstructed vantage point to take in the massive beauty of the Kvichak River and the surrounding wilderness. 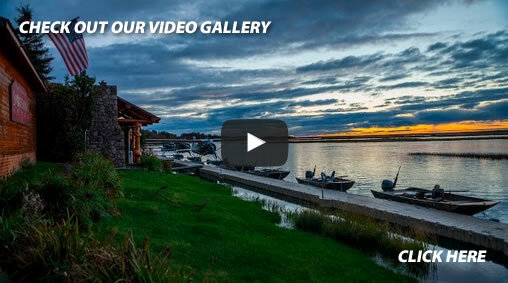 These accommodations and view are the perfect combination for your next fishing vacation. Pricing is per person based upon 4 people staying in this cabin. Fly-outs from the lodge are INCLUDED in our fishing program. June 8 through Oct 1 Average size is 24” – 26” fish on many rivers throughout the region. June 10 through July 31 Excellent fishing throughout the season for 25 – 30 pound fish. June 28 through July 20 World’s largest salmon run passes right in front of the lodge. July 28 through September 25 Very exciting fish to catch; excellent combo with big rainbows. August 20 through October 5 Trophy fishing for the largest rainbows in Alaska right in front of the lodge on the Kvichak River. July 15 through August 20 Great fighting sport fish averaging 12 pounds; excellent for fly fishing.